Have you ever felt unsure if your efforts on Twitter were really making a dent in the grand scheme of things? I mean, how do you know if your Twitter game is having a positive impact on your brand and driving results? Everyone’s going to have different goals that they’re trying to accomplish by tweeting, but ultimately, you need to be clear on the metrics that matter most to your business and customers. 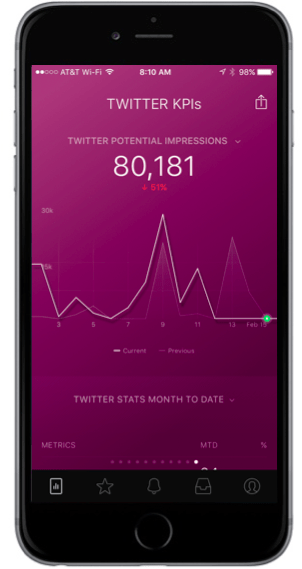 Twitter provides users with analytics.twitter.com, which displays nearly every key metric about your tweets, followers and everything else under the sun on the platform. But the key is to find the signal amongst the noise and zero in on what you actually need to pay attention to. Should you be worried about the number of tweets you send out each day or the profile picture you use? But I think there’s more important data to measure and include in your own Twitter dashboard if you really want to understand what’s going on. If you build it, they might come. But that’s only if you provide value and aren’t afraid to be creative and engage… a lot. Tracking the number of followers you have may seem a bit superficial. And some argue that follower counts are nothing more than vanity metrics. But for my money, and when done legitimately, I think the size of your following speaks to relevancy, general effectiveness and a positive perception of your brand. Having a lot of followers doesn’t substitute for quality of work or knowledge/expertise, but it can demonstrate that you’re reputable and you deliver the goods. Don’t just track the “how many” though. You’ve also got to look at the who! For me, it’s very valuable to see where my audience resides, the industries they work in, their relevant interests, their gender… all of these metrics can be leveraged while mapping out content and your overall strategy. If you’re seeing a bit of stagnation, don’t forget that it works both ways! Seek out Twitter users who you feel may benefit from your efforts on social. A crafty way to find new potential community members is by going through user-curated Twitter Lists. There are typically a lot of like-minded people on these who may be interested in seeing/reading what you and your brand are up to. I feel compelled to mention that the number of followers you have means literally nothing if you’ve a) bought them, b) they’re bots or c) they do nothing but promote themselves. Okay fine, if the Queen Bey is following you, that’s probably a good thing. But don’t hang your hat on volume if there’s no value. It feels great to be retweeted. When your followers share your stuff, you feel like you’re making a difference. Did you know that 70% of respondents retweet because they like the content that a business is creating/curating? A higher volume of retweets also usually indicates that your content resonates with your community. This is essentially showing you how often your community is moved by what you’re tweeting. Is what you’re saying or sharing meaningful to your audience? Does it make an impact or is it falling on deaf ears? If you see that your retweets are super low, it means that your content isn’t really resonating and you probably need to alter your approach. Conversely, if you notice certain tweets that have a very high retweet count, you’ll want to be sure to draw insights about what’s working and why. The importance of holding genuine conversations with your followers to show an interest in what they’re working on or their feedback on your products and services can’t be overstated. Social is supposed to be, well, social. You should be driving conversation instead of always pushing agendas. By building relationships with no expectations in return, a natural reciprocity will develop between you and your followers. Think about it: if your brand takes the time to answer customer questions or jump into conversations about your products, don’t you think that’s going to make you more likeable in the eyes of your community? Isn’t it likely that affinity for your services is going to strengthen and lead to more retweets? Who knows, before long you could be on your to breaking Ellen’s record. In my mind, engagement is the lifeblood of Twitter. It’s what drives brands to produce high-quality content. It elevates the level (and volume) of conversation that takes place. It helps build relationships and encourage new connections. If people like you, they’re going to engage with you! But it’s not enough to just be liked – you want your community to love who your brand is and what you’re doing on Twitter. And frankly, the best thing about impressions is that they’re almost entirely in your control. Every action you take on Twitter is going to have an effect on the total iterations of your Tweets your community’s devices. It’s like anything in life: the more you put in, the more you’ll get out. The number of impressions your tweets and content receive can dictate whether you continue to see a campaign through, or if the results aren’t where you want them to be, cause you to shift your strategy altogether. 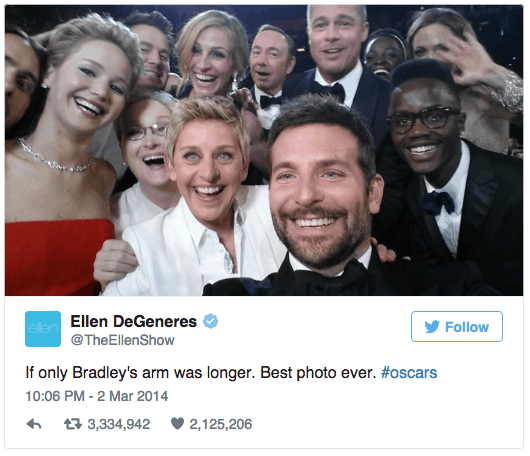 Impressions are ultimately tied to the reach and size of your audience – you can find out exactly how many people saw a specific tweet and upon digging deeper, paint a clearer picture as to whether or not it was effective. The more impressions your content has, the greater the brand awareness you generate will be. Are you interested in zeroing in on more of the metrics that matter? 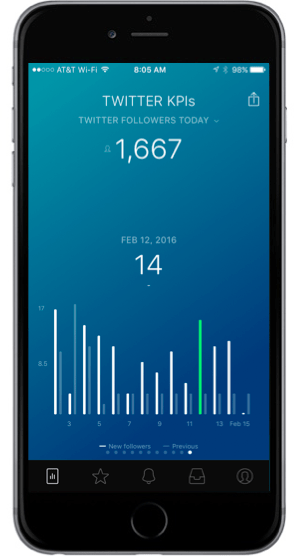 Databox enables you to create custom dashboards for your social media and more. Just request an invite here, or tweet us at @databoxHQ or @mattblackink!